As with all gardens, the impact of the plantings in the borders at Glyndebourne is made up of hundreds of small plant associations. The way that one plant looks next to another creates a little picture that links with other plant groups. When choosing plants that might look good together there are many things to ponder. Colour is often the first consideration but flower shape, foliage texture and the plants’ habit all play a part. 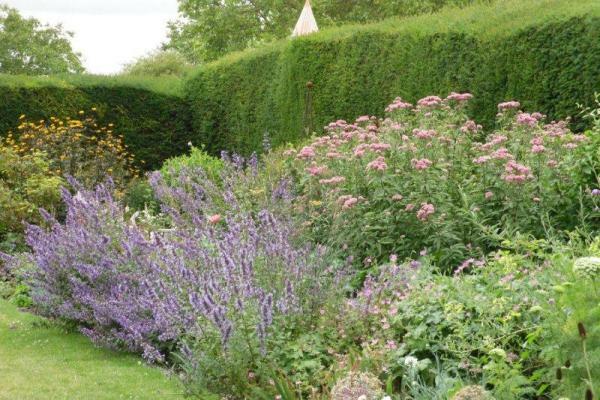 Plants with the same colour or habit will usually look good growing together, as in the blue border at Glyndebourne. the same qualities though: sometimes opposites make bold statements. The wave of box domes in the terrace borders, for example, is interrupted by the spikes of Allium sphaerocephalon, which in turn echo the the spires of Eremurus himalaicus. At the end of the same border, an acid yellow Euphorbia and a magenta Bergenia (both colours that can be difficult to place) grow together to make a zingy and refreshing sight. When considering which plants to put together we often pick a few flowers to see what they look like when held closely together. Of course, the best laid plans of gardeners will always go awry. The early flowering of one plant, coupled with the sulking flowers of another means that what was a perfect match one year may look dull the following. The disappointments are made up for by those serendipitous unplanned flowerings that sing out far more loudly than anything carefully considered and constructed. Sometimes nature has the better eye.